Such is the lesson for Ben Stiller and Naomi Watts’ childless and unaspiring couple to learn; both he, a documentary filmmaker working for over a decade on his latest film, and she, the daughter of Charles Grodin’s much more respectful filmmaker, clearly both have problems adjusting to their modern middle-aged lifestyle, especially when their friends are starting families and relishing in their new responsibilities. They are gradually becoming relics in the world they grew up in, and like anybody going through a similar mid-life crisis they’re desperate for an opportunity to break out of this mould. Enter Adam Driver and Amanda Seyfried, as the younger and much hipper couple Jamie and Darcy, whose chic way of life and vibrant attitude to things ignites a spark within Stiller and Watts’ Josh and Cornelia to rekindle their youthful energy and embrace this newer, more exciting generation. So far, so good; and it’s a relief to report that for the most part While We’re Young explores as many of these areas as possible in the most fascinating and intriguing way that only Baumbach can provide. What may surprise some viewers, however, is how nightmarish it can also be. Around halfway into the film, when Jamie – himself an aspiring filmmaker – recruits Josh to help with his own project, the film starts to unravel as something resembling a psychological thriller in the style of Woody Allen. The motivations of other characters start to come into question, and it almost becomes a strangely Orwellian tale of how the fresher faces of society are slowly plotting their dominance over their expiring counterparts. The film even closes on a final image that’s both disturbing and accurate regarding generations to come, suggesting that the threat is far from vanquished as is the case with most horror films and the “final scare” motif. Meanwhile, a much earlier scene sees Cornelia accompany her friends to a baby concert for their infant children, and the coupling of their incessant cries and the frighteningly cheerful tone of the musicians would cause anyone to bolt in that situation, let alone Cornelia. In this sense, Baumbach has crafted an effective social satire that is both informative and witty while also being uncomfortably accurate about the lengthy generation gap and how feelings of entitlement are translated in very different ways for each side. Of course, any true feelings of terror and dread are unintended (or are they? ); this is still a comedy-drama with heavy influence from Allen’s filmography with a chic, hipster vibe thrown in for outrageous effect. Jamie and Darcy’s apartment, for instance, is littered with old vinyl records, an old-school typewriter and old VHS cassettes compared to Josh and Cornelia’s own MacBook and Netflix-dominated life. One odd set piece takes place at a ritual involving the ingesting of a slushy liquid accompanied by endless projectile vomiting, satirically highlighting the laughably odd methods of spiritualism in this particular culture. As the film gets into the morality of film authenticity during its third act, in a sub-plot that harkens back to a similar controversy regarding the MTV spin-off of Catfish among others, there is even a harsh social commentary on what one perceives to be a documentary as opposed to a manipulated set of clips. Stiller and Watts are stronger than they have been in recent years – Watts, flying high off the success of Birdman after miserable failures like Diana, is especially impressive – while Driver and Seyfried are also given subsequent moments to shine. Baumbach gives each actor full reign to give his characters further depth and pathos, and all of them score wonderful points which provide them with some of their most poignant roles in a good long while. 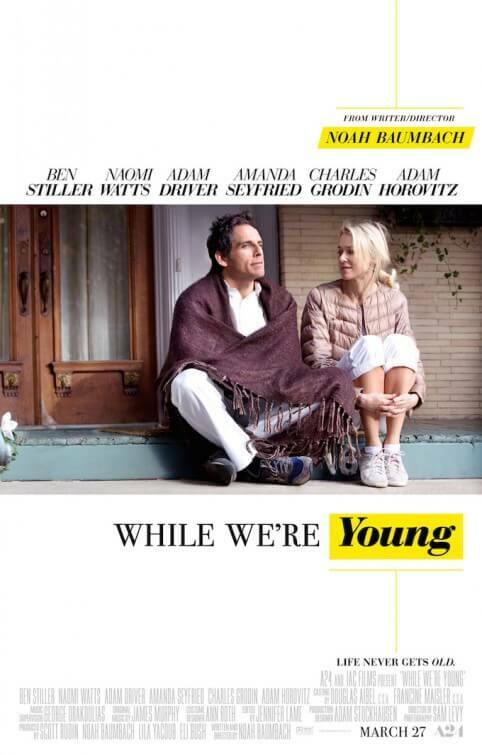 While We’re Young is an intriguing and at times frightening social satire of the current generation gap, boosted by Noah Baumbach’s playful tone and winning performances by its leading quartet.